Kathy has worked with children’s programs and summer camps for over 30 years. A graduate of Eastern Illinois University, she has also been a self-employed business owner for over 30 years specializing in real estate. Kathy once received the “Celebration of Human Spirit” award, started the first Cub Scouts group in the Fraser Valley, was an active 4-H leader for 12 years, and was the recipient of the 2011 Colorado Rockies Leadership Award. She founded Shining Stars in 2001 and has since been the energy and leadership behind the development of the Foundation. In her free time, you can find Kathy out riding her horses or cross country skiing. She dreams of one day being a competitive endurance rider! Megan is a graduate of Westmont College in Santa Barbara, CA where she specialized in international development and studied nonprofit organizations all around the world. She has completed 18 months with the AmeriCorps VISTA Program promoting the growth and development of Chicago based nonprofits. In 2010, Megan began working with Shining Stars. She loves trail running, skiing, snowball fights, and has a slightly secret juggling talent! Ryndi grew up in the Winter Park and Fraser Valley. She graduated in 2013 from Regis University in Denver, CO, with degrees in Communications and Spanish. Following graduation, she worked for Habitat for Humanity of Metro Denver, during which time she had the opportunity to help coordinate and promote the 2013 Jimmy and Rosalynn Carter Work Project. Ryndi started working for Shining Stars in 2015. 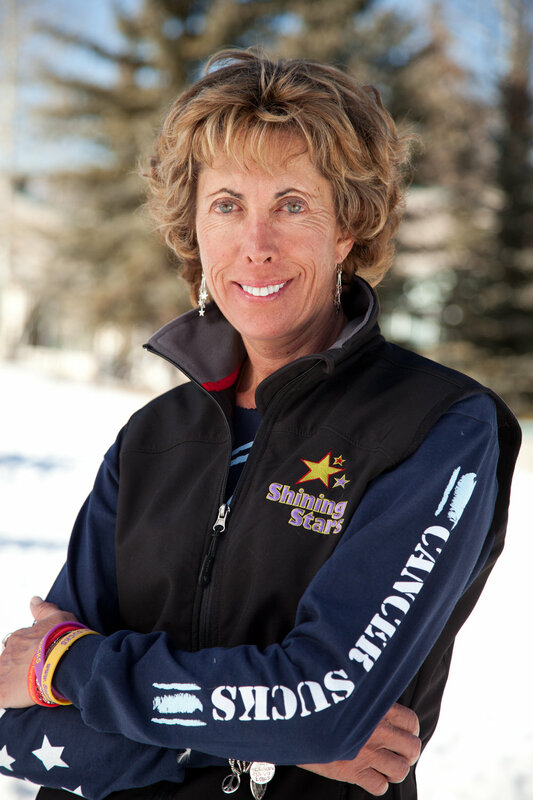 She loves to ski, mountain bike, and run, and she loves sharing her passion for outdoor adventure with the children and families of the Shining Stars Foundation. Prior to joining Shining Stars in 2007, Cookie taught grades Kindergarten through third for 35 years. Over the years, she has worn many hats such as English Language Learners Coordinator, Special Events Coordinator, Curriculum Developer, Teacher Ambassador to Russia & Japan, and Guest Instructor for the University of Colorado at Denver. She received her degree in English/Secondary Education from Colorado State University and is a multiple year honoree for Who’s Who Among America’s Teachers. Cookie loves working with children of all ages and visiting with all the amazing families we serve. She loves socks, golfing, laughing, and star earrings! Rosemary started working for the Shining Stars Foundation in the fall of 2013. Prior to joining our team, she graduated from the University of Illinois at Champaign-Urbana with a degree in English Literature and Sociology. The summer after graduating, she was a program fellow at The Taproot Foundation, a capacity building non-profit in Chicago. The mountain lifestyle called her to Winter Park, and she has been in Grand County ever since! In her free time, Rosemary enjoys skiing, reading, making birthday cards, cooking, gardening and beekeeping. Her favorite thing about working with Shining Stars Foundation is the opportunity to get to know our kids and families.